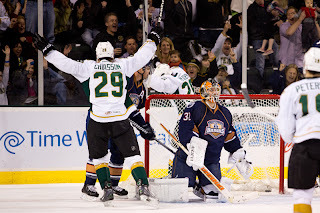 After scoring the first goal but spotting the Barons three, Texas roared back in the third period and took a nailbiter ten round shootout win off the stick of Jamie Oleksiak. "We had the first, they had the second and the third was a battle," said Coach Desjardins. "We both battled, but we got a couple of breaks." Mike Hedden was a difference maker for the Stars' tonight as his line continued to click. Hedden had a power play and even strength tally while Justin Dowling added his seventh of the season, a power play goal, to tie things at three late. Alex Chiasson added a goal in the shootout. "We've been getting the chance to play together and we've got good chemistry together," said Hedden. Texas came out on fire in the first, taking all the early chances and coming close on quite a few. Back-to-back penalties for holding and hooking in the mid-period slowed down that momentum. Texas got it back when Mike Hedden collected his fourth of the year on the power play. The puck came to him just behind the goal line with goalie Niko Hovinen on the other side of the crease. "It had a lot of spin on it," said Hedden. "I knew I had a lot of time. I just wanted to make sure I got it and got it on the net. It was a great job by Petersen to get it on net." The patient move he put on made it 1-0 after twenty minutes. The Stars outshot OKC 18-6 in the frame. Texas's second period was messy out of the gate with a lot of odd-man situations making life difficult for the Stars' netminder Campbell. "We haven't given up that kind of two on ones and breakaways in a while," said Desjardins. "They had a lot of shots right away in the second." Jamie Oleksiak, who was playing in his first game after assignment from Dallas, expanded on how the Barons took their second period lead: "I think they were very aggressive and had a lot of high guys." That being said, Jack Campbell kept Texas in it, stoning at least two breakaway shooters and stretching the width of the crease to stop a two-on-one tap-in on the back door. "Campbell is an unbelievable goalie," said Hedden. "We gave up a lot of odd-man rushes tonight, and Campbell stood on his head." It didn't last forever as the Barons scored twice in just over two minutes in the late second period to take the 2-1 lead. Pelss scored from the right wing circle while Josh Green scored from just out in front off of a Toni Rajala pass from behind the net. OKC extended their lead in the third as Travis Morin got called for a trip and Antti Tyrvainen was awarded a penalty shot, which he scored on. The trip looked a little forced but it was a penalty shot nonetheless. It was a situation that shouldn't have happened as Morin was forced into a bad position of having to trip Tyrvainen after the Stars let him in alone. Oleksiak commented, "[Our mantra was] there's nothing we can do about the goal. Just get one right back." "We came out flat in the second period," added Hedden. "In front of the home barn, we wanted to have a big third." Texas did just that as Hedden tipped Chiasson's laser past Hovinen off of a nice blue line keep by Jamie Oleksiak. Just three minutes later, the Texas power play would get another on the night with Justin Dowling deflecting a Petersen shot in the crease for the three all tie. A scoreless OT would give way to a shootout. This time, it was ten rounds. "It's a pressure situation, and it's tough to score with these goaltenders," said Desjardins. Josh Green scored on the first shot of the shootout while Texas tied it up in the third round thanks to Alex Chiasson. It came down to Jamie Oleksiak in the bottom of the tenth round. Weary from travel from Vancouver yesterday, the rookie defenseman ended it with a puck off the pipe and in past Hovinen. "I can't say enough about the effort," said Oleksiak. "It was a great character game. We just have to keep that momentum going." Texas will try to do just that as they face the same Barons again tomorrow night. Line shuffles happened in the second period tonight as the Fraser-Sceviour-Morin line was reunited and Wathier moved down to play with Fyten and Petersen. Texas could be without Tyler Sloan and Patrick Nemeth tomorrow as both left the game and did not return. The original write-up says: "...Hedden shot a laser past Hovinen off of a nice blue line keep by Jamie Oleksiak." Hedden actually tipped Chiasson's laser past Hovinen. The "tripping" call was terrible. Travis lifted the Barons stick, and because he was tripoding on the stick he went down. Travis never made contact with the body, thus the reaction of the crowd.